A monumental, genre-defying novel over ten years in the making, Michel Faber’s The Book of Strange New Things is a masterwork from a writer in full command of his many talents. It begins with Peter, a devoted man of faith, as he is called to the mission of a lifetime, one that takes him galaxies away from his wife, Bea. Peter becomes immersed in the mysteries of an astonishing new environment, overseen by an enigmatic corporation known only as USIC. His work introduces him to a seemingly friendly native population struggling with a dangerous illness and hungry for Peter’s teachings—his Bible is their “book of strange new things.” But Peter is rattled when Bea’s letters from home become increasingly desperate: typhoons and earthquakes are devastating whole countries, and governments are crumbling. Bea’s faith, once the guiding light of their lives, begins to falter. Suddenly, a separation measured by an otherworldly distance, and defined both by one newly discovered world and another in a state of collapse, is threatened by an ever-widening gulf that is much less quantifiable. While Peter is reconciling the needs of his congregation with the desires of his strange employer, Bea is struggling for survival. Their trials lay bare a profound meditation on faith, love tested beyond endurance, and our responsibility to those closest to us. 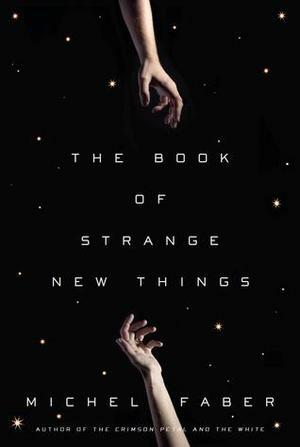 Marked by the same bravura storytelling and precise language that made The Crimson Petal and the White such an international success, The Book of Strange New Things is extraordinary, mesmerizing, and replete with emotional complexity and genuine pathos. Perhaps my error was in hoping this book would be like Mary Doria Russell's _The Sparrow_. Of course it wasn't—it couldn't be, and that was an unfair standard to hold it to. Nonetheless, I was rather disappointed in this novel. In the dual plotlines (Peter's on the planet, told in 3rd person and his wife Bea's on earth told through her letters to him) both accelerated to the denoument unexpectedly and did not so much wrap up as simply finish. This sense of simply finishing was satisfying in The Crimson Petal and the White, but in The Book of Strange New things the plot and character development was to thin to support an ending and abrupt ending. I was intrigued by the paired dynamic of bodily harm/bodily healing in the two plots--but again, found these to be suddenly introduced and not sufficiently woven throughout the book to offer that sense of pieces falling together when the narrative reveals the crux of the crisis in the plot. Really interesting reading experience here. I found the main character at best annoying and at worst reprehensible. Plus a cat dies and that was particularly awful to read BUT it was definitely well written and interesting at times, enough for me to finish the 500 page novel. The Book of Strange New Things contains futuristic technology, space travel, and extraterrestrial beings, but it is not science fiction. Instead, it is the portrait of a marriage. Peter and Bea are a happy and deeply religious married couple. He is the minister of their church and a former drug addict. She is the lovely nurse who brought him to God. A mysterious corporation is colonizing a faraway planet, and Peter is chosen to preach the word of God to the native population. For unknown reasons, Bea cannot accompany him. They are confident their love can withstand the great distance. Part of their confidence unconsciously stems from the fact that they have never been apart before. Unfortunately, Peter - like all the men I have dated - turns out to be crap at long-distance relationships. It turns out he has landed the cushiest missionary gig in the history of Christianity. The aliens already have some understanding of the Bible - they already speak some English! - and eagerly listen to his teachings. Peter is so absorbed by tending his flock and building his church that he does not always respond to his wife's letters. Bea, in contrast, describes natural disasters that destroy entire countries and the collapse of Britain's infrastructure. The destruction, combined with pregnancy and her husband's seeming indifference, make Bea's letters more and more frantic, but Peter cannot - or will not - relate to her experiences. He has a frustrating lack of curiosity, especially regarding the motives of his employer, and is quite happy playing with his new alien friends. The central concern of the book is not what the corporation wants, or what the natives want, but what Peter wants! Like [b:The Bone Clocks|20819685|The Bone Clocks|David Mitchell|https://d.gr-assets.com/books/1398205538s/20819685.jpg|26959610], The Book of Strange New Things raises more questions than it answers. It confused me, irritated me, and left me longing for more. Michel Faber has said this will be his last book, but I hope that he changes his mind and revisits this world that he created.